Naumkeag is one of America’s finest gardens. 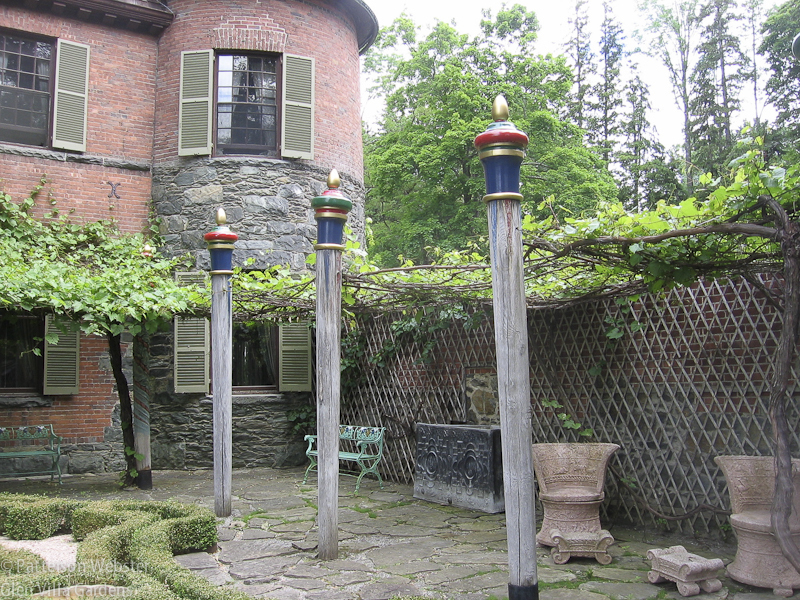 Located in Stockbridge, Massachusetts, and designed over a period of 30 years from 1925-1956, the garden reflects the desires of the last owner, Mabel Choate, and the skills of her friend and collaborator, the landscape architect Fletcher Steele. Pushing the boundaries of the old Beaux Arts traditions, together they took ideas culled from many trips abroad, from the Italian Renaissance to French modernism, and wove them into new forms to create an American masterpiece. 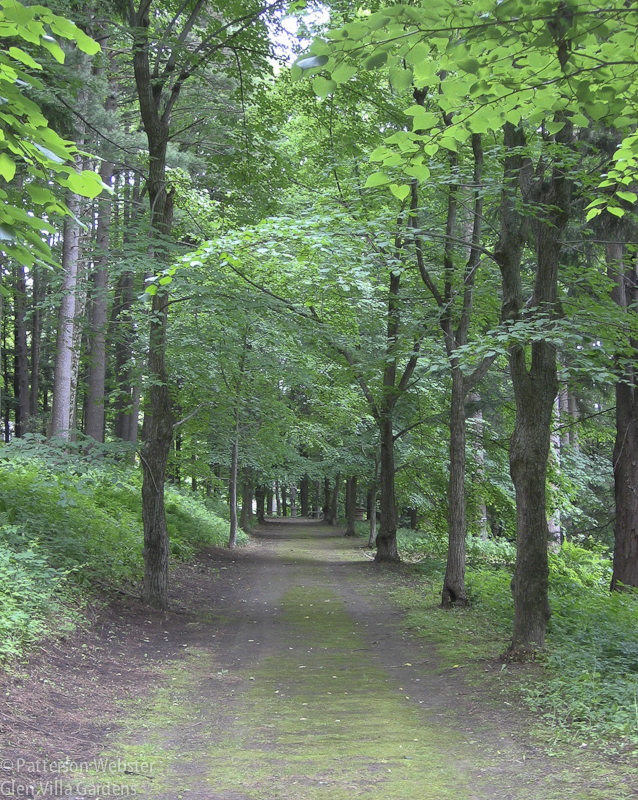 In 2007 I visited Naumkeag for the first time. 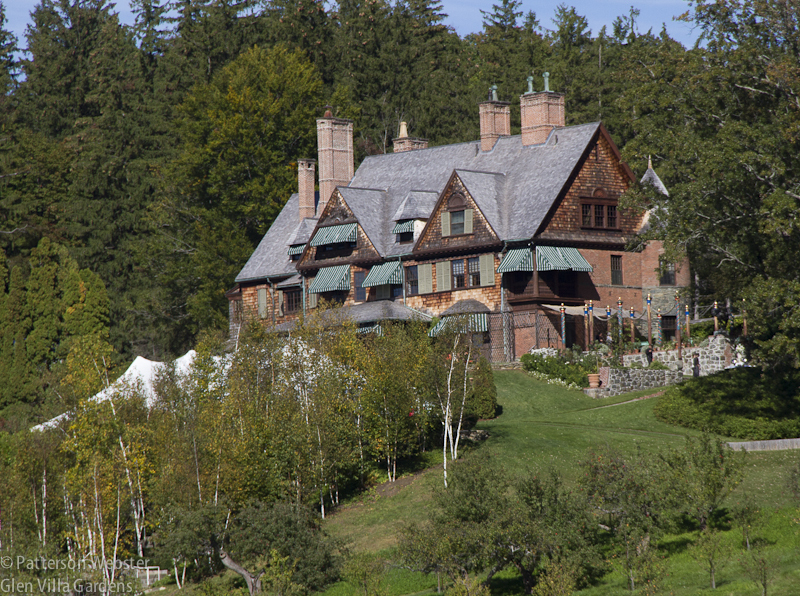 I loved the place — the shingled house, the views onto the countryside, the flavour of a Gilded Age, country style. The Afternoon Garden with its rope swags, painted gondola poles and strangely decorated furniture charmed me. The swirls and exuberance of the Rose Garden opened windows onto new attitudes towards the arrangement of flowers in garden beds. The Blue Steps, an icon of American garden design, were even more wonderful than I anticipated, stylish and modern in their use of ordinary materials. The terraces, the outlooks, the details of edgings and the shapes of steps and benches: all suggested ideas I could use to improve my own garden. It’s true that the Chinese garden was a disappointment — it felt like a tired afterthought — but with so many other aspects of the garden to admire, I easily overlooked its short-comings. The shingle house was designed in 1884 by McKim, Mead & White for Joseph Choate, Mabel Choate’s father. 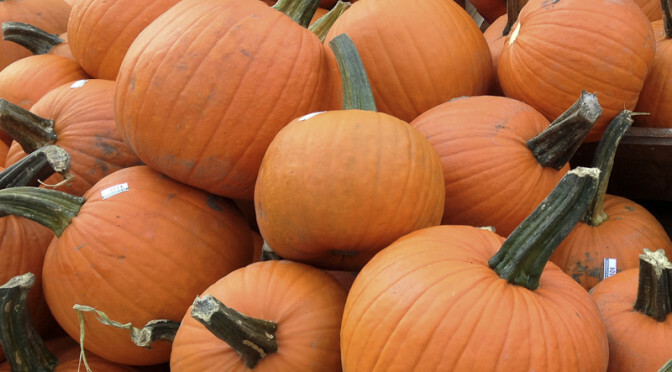 Naumkeag is the native American name for Salem, Massachusetts, where Joseph was born. The Afternoon Garden is next to the house on the right. The Blue Steps are hidden in the birch trees that partially block the white tent, there for a wedding reception. That was eight years ago. In those eight years I’ve grown as a gardener and landscape designer. 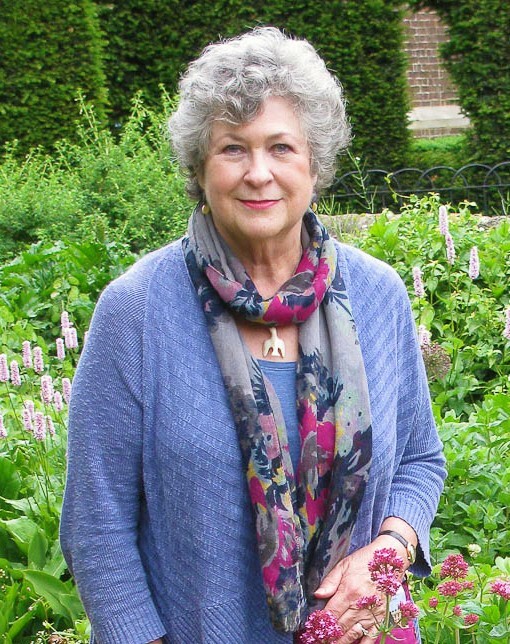 I’ve visited outstanding gardens around the world and honed my own skills and ideas. So when I planned a return visit to Naumkeag earlier this month, I wondered if I would still be as delighted by what I saw. I was. If anything, I found more to admire in Steele’s designs, now being restored as part of a multi-million dollar project that began in 2013. I arrived unaware that work was going on, but the barriers around the Chinese garden alerted me immediately. 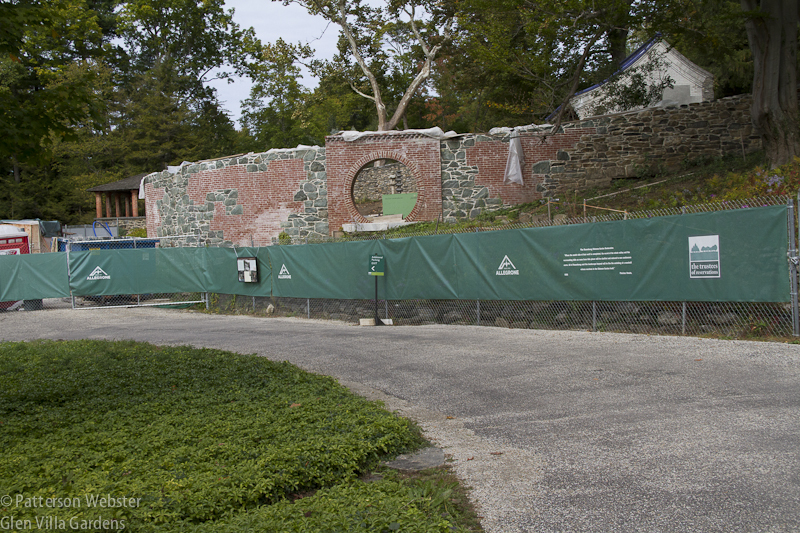 This final part of the three year, four phase $3 million restoration project is scheduled for completion in 2016. 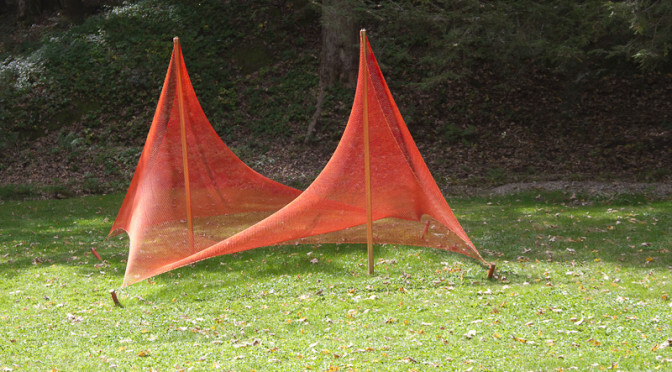 The Afternoon Garden, referred to as Mabel Choate’s ‘joy and delight,’ was the first project on which Steele and Choate collaborated. It dates from 1926.
with what it looked like now. Some of the changes I noticed immediately — the shiny new gondola poles in particular — but others I noted only when I compared photos. Mabel Choate loved Venice so Fletcher Steele incorporated 18 gondola poles and finials into the design of the Afternoon Garden. They were carved in 1928 by Archangelo Cascieri, a famous sculptor and wood carver in Boston. 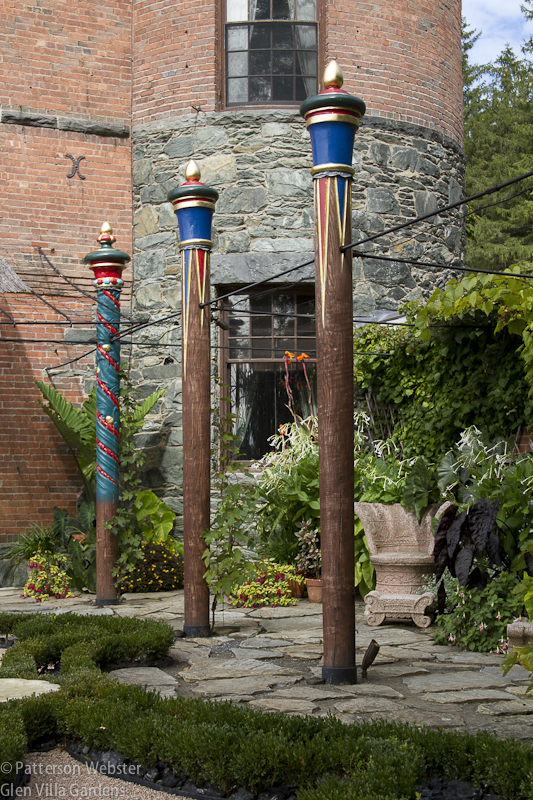 The current poles are made from New England-sourced oak and were hand carved and painted by one of his apprentices, Robert Shure, and his artisans at Skylight Studios. Note also how much more greenery there is now around the fountain against the wall. In the central portion of the Afternoon Garden a small pool is surrounded by an intricately woven boxwood parterre. Fountains shaped like scallop shells add a light touch, as do the elaborate and oddly coloured chairs and benches. 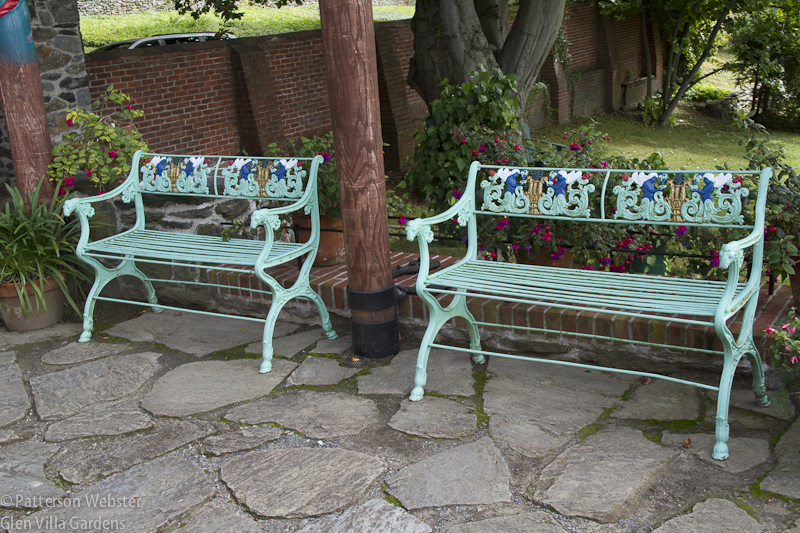 These benches have been restored and repainted in their original colours. Before and after photos illustrate how effective the restoration has been. Elements that were hidden are now highlighted. The scallop basins are hidden in the vegetation in this photo from 2007. 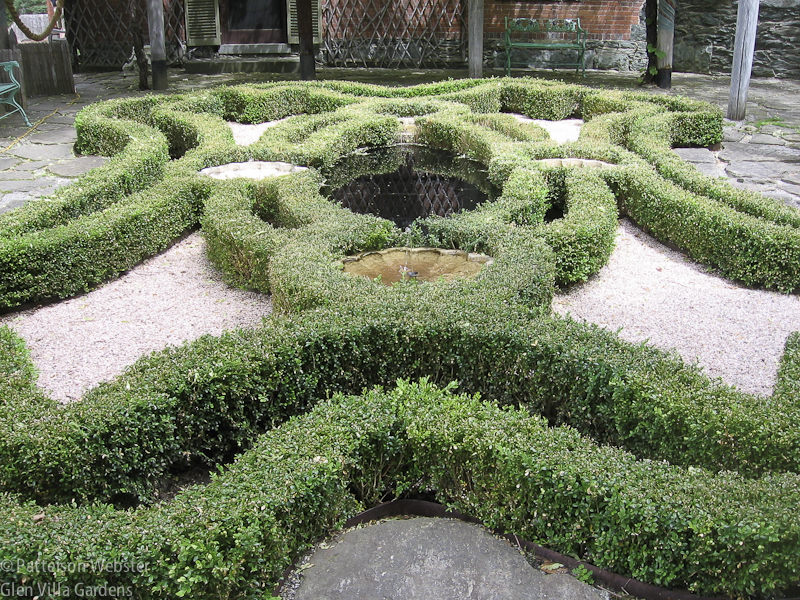 Newly replanted, the boxwood is now in scale with Steele’s intent, and the details of the intricate design are clear. 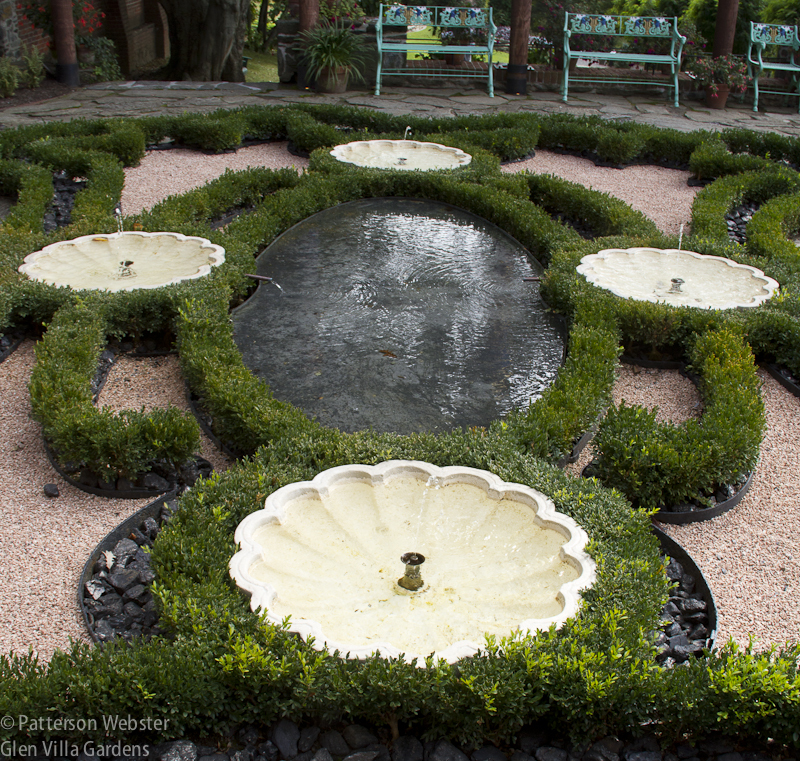 The scallop basins now take pride of place in the boxwood parterre, showcasing the details of Steele’s design. Unfortunately, despite major work on Naumkeag’s entire water system, they were not spouting when I was there. Even more impressive were the changes to the Linden Walk. 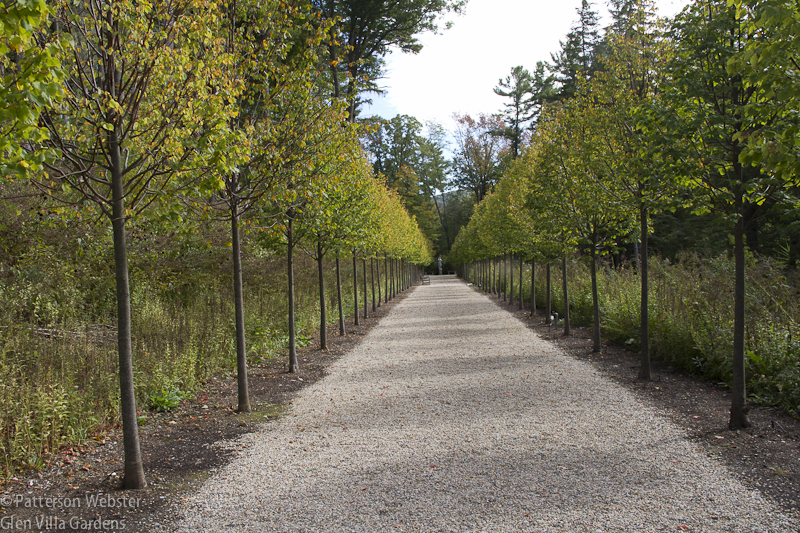 This allée, inspired by the linden allées of Berlin, was planted in 1890 by Mabel’s mother, Caroline Choate. When I visited in 2007, the walk was dark, almost spooky. The trees were damaged and overgrown. This isn’t an ordinary country road, although it could easily be taken as such. Now the allée sparkles in the sunlight. Seventy-one linden trees planted in 2013 now line the allée. Cocoa shells originally provided mulch for the trees and gave out a distinctive smell of chocolate. The mulch now is much more ordinary, and unscented. 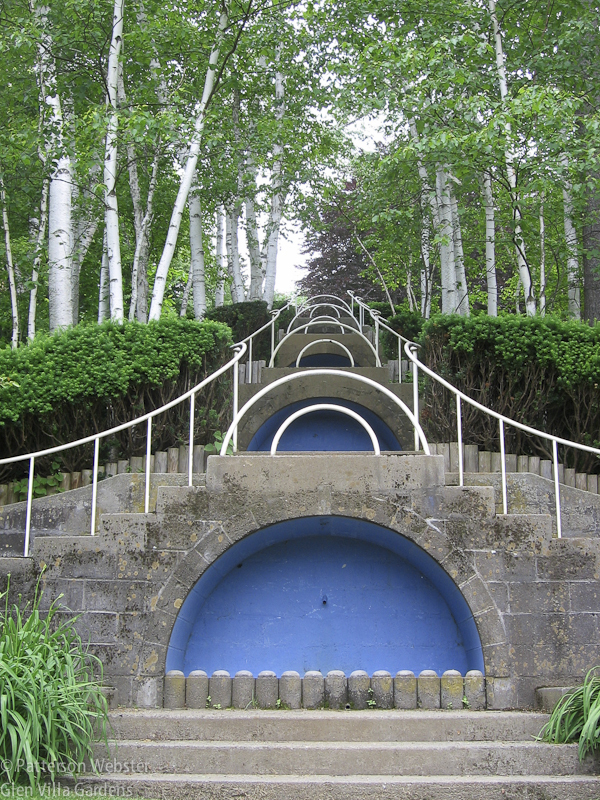 The Blue Steps, arguably Fletcher Steele’s most famous design, were built when Mabel Choate asked for an easier way to get from the house down the hill to her cutting garden. Major changes here involved a complete renewal of the water system that feeds the runnell, or rill, that moves from the Afternoon Garden to the Blue Steps themselves. I failed to even notice this feature in 2007; now its downhill trajectory can’t be missed. Water trickles down the central depression in these stone and brickwork steps. The small changes of level are meant to suggest fish scales. Shining in the sunlight, they do. 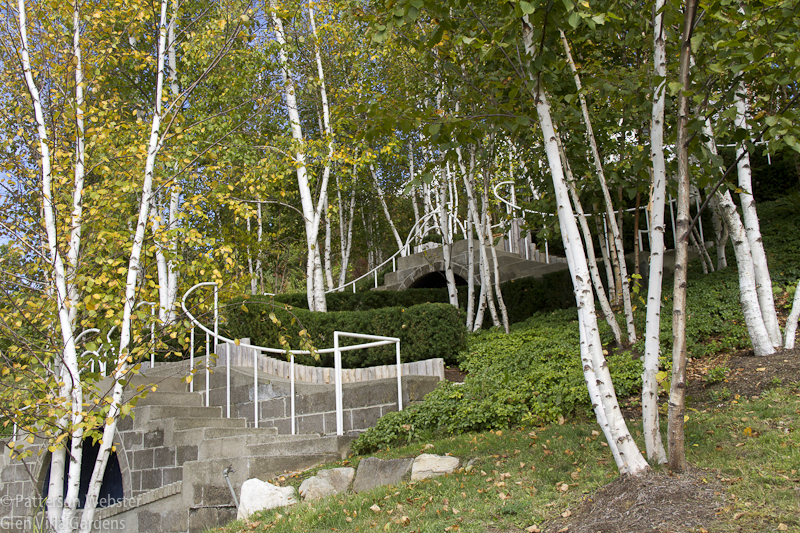 Many of the birch trees that frame the Blue Steps and create the contrast between the step’s Renaissance-inspired forms and the natural forested hillside around them have been replanted. The concrete half-moons that rise in sweeps have been repainted. This photo shows the Blue Steps as they appeared in 2007. Steele and Choate experimented with different colours, finally settling on this shade of light blue. The re-painted areas appear a darker shade but I can find no reference to confirm this. The shrubs surrounding the steps, replanted in 2013, are no longer bare at the bottom. The curving metal handrail is as graceful as always, accentuated now by a shorter hedge. The Blue Steps are seen here from the side, with autumn foliage. There are flowers at the bottom of the steps but Mabel’s original cutting garden is not there in its full glory. Restoring this feature would return the Blue Steps to their original purpose and provide a stronger reason for the existence of The Blue Steps themselves. 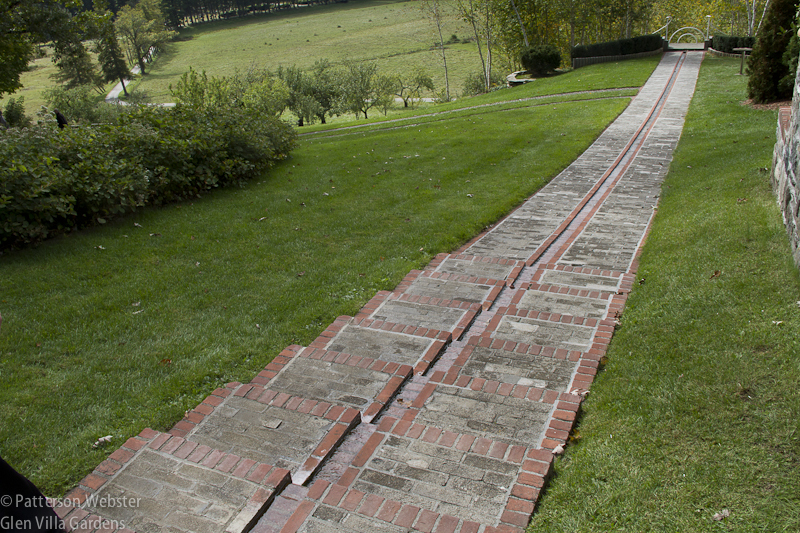 The rose garden, designed by Steele to be seen from Mabel’s bedroom above, continues to scroll across the ground, as it has since 1952. 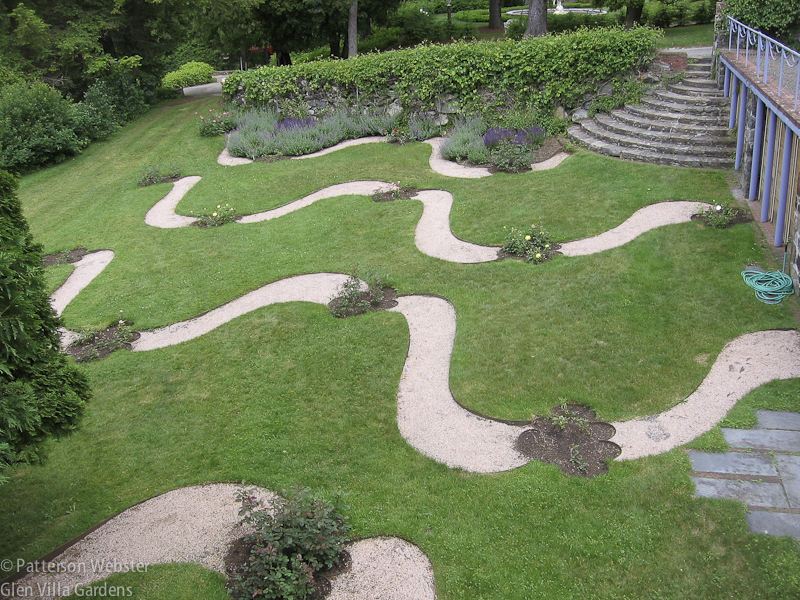 This photo from 2007 shows the design of the Rose Garden and the semi-circular steps that lead to it. Eleven scalloped waves of pink gravel are planted at intervals with a variety of rose bushes. They have not been in bloom on either of my visits. The roses in the Rose Garden are scheduled to be replanted next year. Knowing this pleases me — it gives me a reason to return for a third visit to this splendid site, one of only a few Fletcher Steele–designed gardens open to the public. I look forward as well to seeing the Chinese garden. When it re-opens, I expect it to be as greatly improved by the restoration as other parts of the garden have been. Bravo to those responsible and all those involved in making this project a success. A special acknowledgement should go to the generous donor who put forward the original $1 million challenge grant. Thank you, whoever you are! A practical note: Naumkeag is open May 24 to October 12, daily, 10AM to 5PM. Allow a minimum of 1 hour for the garden, 2 hours if also taking the house tour.